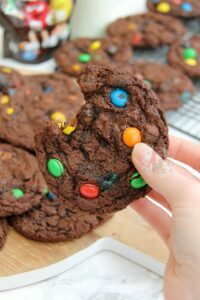 Super Easy and Delicious Chewy, Crunchy, Gooey and Chocolatey M&M Cookies that every Chocoholic will adore. 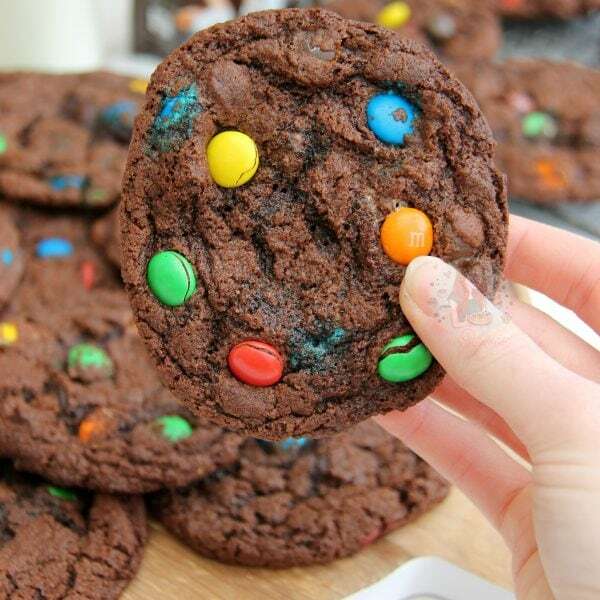 I love Cookies. Everyone loves cookies! 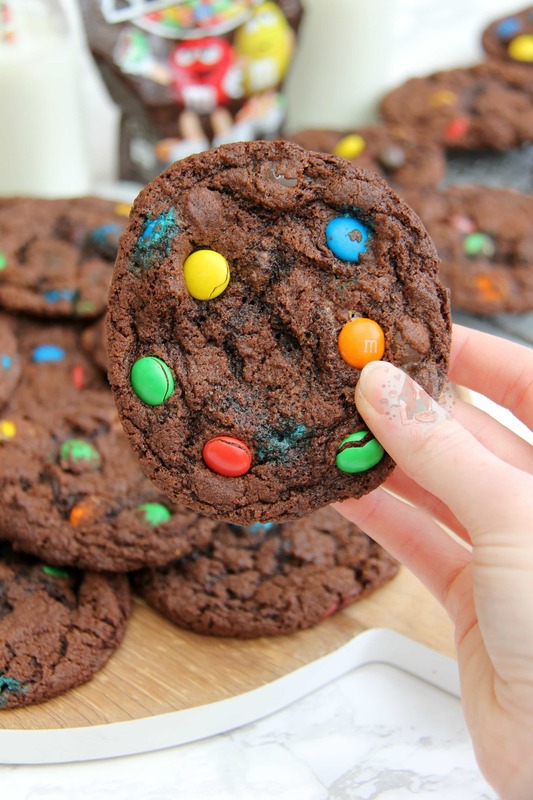 Seriously how can you not love cookies?! Anyway. A delicious chewy, crunchy, gooey and chocolate delicious cookie is my favourite thing ever. Different flavour themes, different shapes and sizes, they are ALL delicious. Even if a cookie is broken, or slightly oval instead of round, its still blooming’ amazing. Dunk them in tea, coffee, or even a hot chocolate and you have a winner! 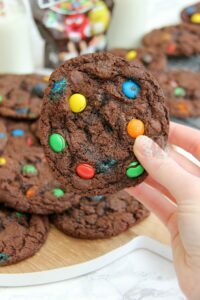 After the success of my M&M Cookie Bars, I knew I needed an actual Cookie version! My Terry’s Chocolate Orange Cookies are one of the favourite recipes on my blog by far. I have made them so many times that I knew I needed a bit of a change.. as much as I adore Terry’s Chocolate Orange, not everyone else does! Therefore, I had to switch things up. 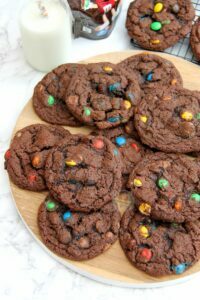 My Toblerone Cookies are such a hit as well that I knew I needed a chocolate based cookie, but with a new theme… hello M&M’s! I had so many bags of M&M’s leftover in my cupboard after I ‘accidentally’ bought too many, so M&M cookies were on the cards. However, I tried used the standard cookie recipe from my Terry’s Chocolate Orange Cookies and they were delicious, but they spread slightly more then my others have. I think this has something to do with the fact that the chocolate is in little shells, so the cookie dough almost falls away from them rather than binding with the chocolate itself. I could be making this up completely, but trying again with Plain Flour instead worked a charm! They stayed more together, not so much that they were too doughy and dry, but the perfect amount. If you find your others spread too much, then try Plain Flour in those as well! I prefer my cookies like this to be chewy/crunchy round the edges, and gooey/soft in the middle. Obviously, this is personal taste! 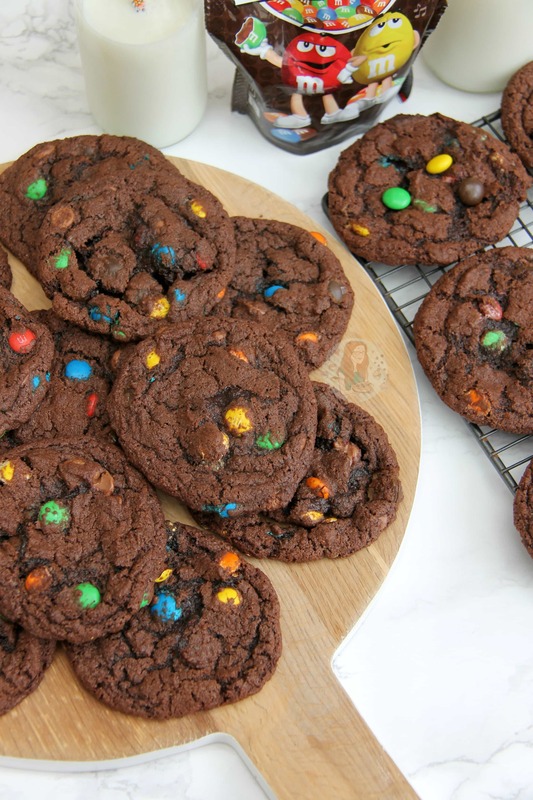 I wouldn’t recommend baking them any less then I have stated as they might be borderline raw if you do… but if you prefer your cookies to be crunchier then add on a minute or two so they bake for a little longer and dry out! You must remember though that cookies and other baked goods do continue to cook slightly as they are cooling, so once these are cooled, they will be harder compared to how they were when they came out! Either way, if you like cookies, you will LOVE these! Enjoy! Preheat your oven to 190C/180C Fan/375F and line two or three large baking trays with parchment paper, leave to the side! Mix together the Butter, Light Brown Sugar and Granulated Sugar until light and fluffy and thoroughly combined – using an electric mixer is far easier for this because it gets very fluffy and perfect! Mix in the Egg, Vanilla Extract, Cocoa powder, Plain Flour, Bicarbonate of Soda, Baking Powder and Salt and beat again until a thick paste/cookie dough is formed. Fold in the M&Ms and Chocolate Chips and spoon the mixture onto the trays! I use a cookie dropper/ice cream scoop to make them identical sizes. Make sure they are suitably spread out on the trays so they stay separate! I usually fit 6 on each tray to be safe. Bake in the oven for 10-12 minutes until spread out perfectly crinkly. They might seem slightly under done still, but they will continue to cook when cooling so don’t worry! Once baked, remove from the oven and leave to cool on the tray for 5 minutes before transferring to a wire rack to continue cooling off completely! Then, gobble them all up! They are super super gooey when warm so you could serve them with a dollop of ice cream if you like (vanilla is perfect with it) and they are an utter crowd pleaser. Any type of M&M will work! I use normal Chocolate M&Ms as they’re my favourite, but your favourite flavour will also work fine! 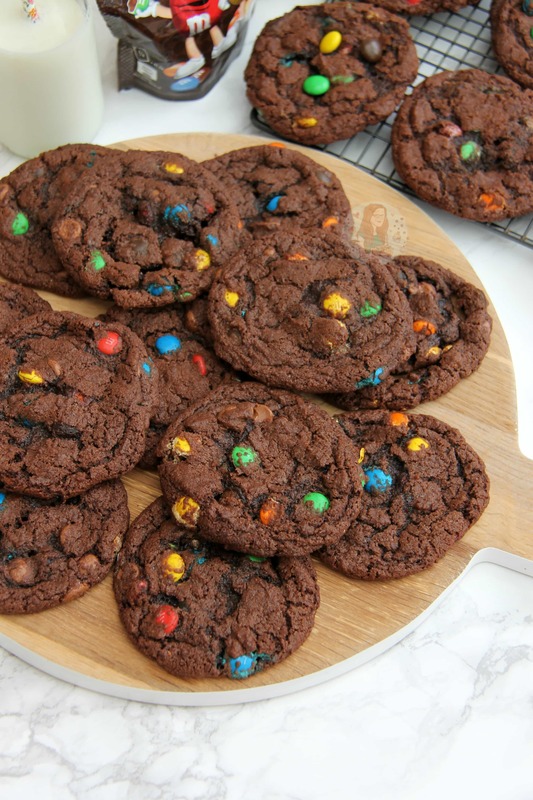 Sometimes the cookies might spread a little if using larger M&Ms like the peanut ones, but they should still be fine after the chilling! These delicious treats will last about 3 days after baking, but trust me, they won’t last that long! Older Next post: White Chocolate and Raspberry Blondies! Newer Previous post: Bounty Fudge! Wow This is very yummy! will You bring out a paperback recipe book like Mary Berry type? They look yummy. I own a little coffee shop in a small town called Portlaw in Co.Waterford in Ireland. I have tried a few of your recipes and they always turn out perfect and yummy. 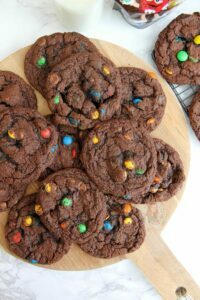 I think I will try these cookies tomorrow! !! Oh that’s amazing! I’m so glad! !